Our most popular elementary text book. Designed from the very beginning with the student in mind! Students WANT to explore it and read it. Now used in over 1500 classrooms! 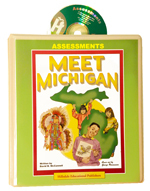 Even with the Common Core, the GLCEs remain the focus of Michigan’s social studies. Meet Michigan now online too! Click here to see the GLCES correlation. 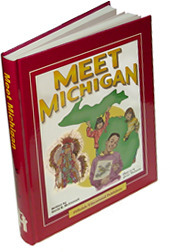 Click here to see a sample chapter from Meet Michigan. 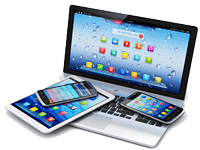 Click here to request a digital preview copy for your school. See our exciting NEW interactive student activities below! 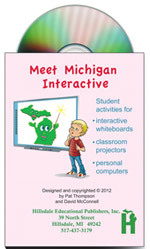 Here are our new technology based student activities to accompany the textbook Meet Michigan! Use them on your classroom whiteboard, projector or personal computers. These activities follow the textbook chapter by chapter. There is a big focus on vocabulary words and chapter review. The activities can also help you with formative assessment. Using them your students can apply what they are learning. These Flash™ programs are supplied on a CD. Click here for more information on this great new product! Audio Edition of student textbook on 8 CDs read by the author, organized by lesson. The teacher’s edition is designed to meet your classroom needs. It is 3 products in one with over 450 pages! 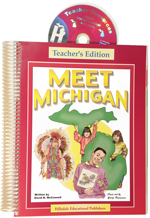 Easy to use spiral bound printed teacher’s edition. A digital copy of the printed teacher’s edition you can load on both your home and school computers provided on an enclosed CD. Over 50 student worksheet activities also provided on the enclosed CD. Click here for a sample from this great product! Provides tests for each chapter. Tests incorporate prompts, charts and graphs, CDVs and extended responses. Each binder includes a CD with the tests on Microsoft Word™ files so you can adapt them to your classroom needs. Click here for a SAMPLE test from this great product!